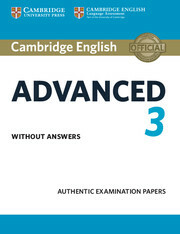 Cambridge English: Advanced 3 contains four complete tests for the Advanced exam from Cambridge Assessment English. These examination papers for the Advanced exam provide the most authentic exam preparation available, allowing candidates to familiarise themselves with the content and format of the exam and to practise useful exam techniques. Colour visual material for Paper 5 is included for each test. The Student's Book is also available as a 'with answers' edition, suitable for self study. An Audio CD set containing the exam Listening material and a Self-study Pack containing the Student's Book with answers and Audio CDs are available separately. Contains four official examination papers from Cambridge Assessment English, making this the most authentic exam preparation material available. Contains a helpful overview of the updated Cambridge English: Advanced (CAE) exam to familiarise students with what to expect in the exam. Get an eSample of Cambridge English Advanced 3 that will allow you to view a product preview on your desktop.